these really helped to keep my daughter warm during cold swimming lessons! easy to take on and off, lightweight, recommended. The Konfidence Micro-Neo wetsuit T-shirts can help kids of all ages stay warmer in the water for longer. Made from ultra thin neoprene, the same material used on wetsuits, these kids wetsuit tops are flexible and easy to swim in. Ideal when your kids don’t want to wear a full wetsuit, but you still want to ward off any chills. 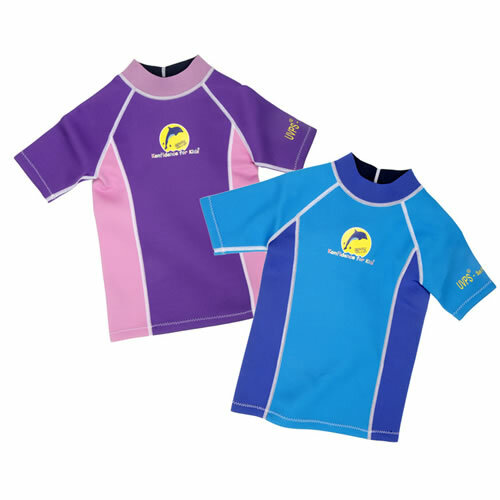 Konfidence kids wetsuit T-shirts are ideal for the beach or in the pool. Konfidence kids wetsuit tops are great for using on dry land too, helping to keep the chills at bay and offering 100% UV sun protection during outdoor use. These swim wetsuit tops for kids are a very practical alternative to both wetsuits and UV protective T-shirts. Made from 1mm thick neoprene, they are soft and flexible enough to allow free movement, but thick enough to keep the chill off both in and out of the water. These neoprene kids rash vests are proving very popular for pool use and are excellent for swimming lessons, where children often feel the cold. They are also a great seaside product - either for splashing in the water or to keep the wind chill off on the beach. As an added bonus these surf tops offer 100% UV sun protection on the covered areas. Konfidence Micro-Neo wetsuit T-shirts help kids stay warmer in the water for longer. 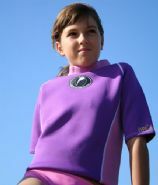 Kids wetsuit tops are flexible and easy to swim in. Very popular for pool use and are excellent for swimming lessons. Konfidence surf tops offer 100% UV sun protection.